Isn’t puff pastry just the greatest invention ever? I for one, would not have the patience or skill to make it by hand. So, I am forever indebted to Pepperidge Farms and their quality premade puff pastry. 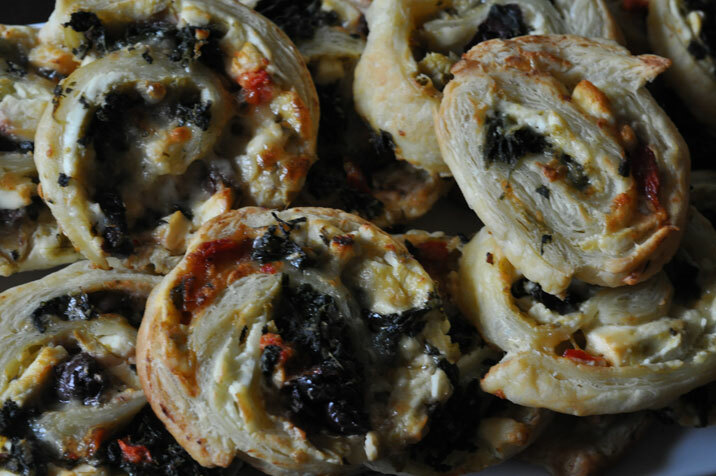 I first discovered Mediterranean Pinwheels when my friend, Jill, brought them to a tennis lady party. Of all places, she got the recipe from her local Fred Meyer Grocery Store. Super easy to make, I made about 10 rolls this past holiday season; freezing the majority to bake later and bring to different events as needed in December. The other thing to keep in mind is that you can change the ingredients up to suit your tastes and ingredients on hand. I’m thinking a southwest chicken chipotle pinwheel would be very fun. To roast red peppers: broil whole red peppers until skin is blackened. Watch and turn frequently until all the sides are blackened. Place in a paper bag for a few minutes. Skin will peel off effortlessly now and then you can remove the stem and seeds. Thaw puff pastry per directions and arrange on a hard, flat surface. You should have 2 sheets of puff pastry, so half the ingredients go on one sheet and half on the other. Spread the cream cheese on the puff pastry. Layer with the feta, olives, artichokes, spinach, red peppers and cheese. Sprinkle with the salt, pepper, and garlic powder. Roll as tightly as you can. Cut the rolls into 3/8 to 1/2 inch slices. Arrange the slices and inch apart on parchment paper lined baking sheets. Bake at 400 degrees for 15 minutes or golden brown. I am really needing a good cleaning check list for my family (and cleaners when they come once a month). I have been trying to search in Google (haven’t tried Pintrist yet) for a logical & easy guide to helping us stay organized, picked-up, and cleaned up. Could you investigate and see if you can find one and post on your website? Maybe have a “Spring Cleaning” tab? I know you are up for this challenge. I need to get my house cleaned up inside and outside! THANK YOU Joan – – I’ve been hoping you would post this recipe on your blog. I believe this is one of the apps you brought to Alex & Lynn’s home for the concert over the holidays. I loved it! Thanks a million – – can’t wait to make it. And thanks for the freezing tip too – – best kind of app!